Like many transplants from the mainland, Shanah Trevenna moved to Hawai’i sight-unseen. After a four-year stint as a mechanical engineer at IBM, she had a change of heart and decided that she wanted to dedicate her life to teaching as a crusader for the environment. Fast-forward five years and Shanah is not only a lecturer at the University of Hawai’i at Manoa and founder of the student group, Sustainable UH, but she is also the co-founder of a statewide student internship program funded by the Environmental Protection Agency (EPA). 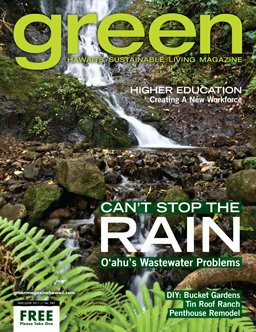 With funding available from both the state and national level, “green” jobs training, internships and programs are the latest steps taken to ensure that sustainability for Hawai’i is obtainable not just as a lifestyle, but as viable career options as well. “While there are many green job training programs and workshops out there, the key is in targeting the youth who will be taking these skill sets with them in whatever profession they pursue after they graduate,” says Asia Yeary, of the EPA. Like Shanah, Asia’s main focus is on educating students about sustainable job opportunities and providing them with internship programs that will provide access to future job opportunities. To do this, she and Shanah created RISE (Rewarding Internships in Sustainable Employment), an EPA-funded program that places Hawai’i college students and recent college graduates in paid internship at the Department of Health, the Department of Business, Economic Development, and Tourism’s State Energy Office, Honolulu Clean Cities, the Department of Education, and the University of Hawai’i. The benefit of these internships is that it gives students the opportunity to apply what they learn in the classroom to real-world projects, such as contributing to diesel emission reduction studies or partaking in energy audits for government buildings. These internships also place students in a position to meet potential employers. Asia herself can attest to this last benefit, as her current job was made possible through contacts she made while working as an intern for the EPA as a post-graduate. In addition to the over-arching goal of providing young adults with exposure and training, RISE also aims to create more jobs within Hawai’i to build the state’s workforce. RISE Program Director Marguerite Harden acknowledges that there is a huge demand for local workers in the green workforce, so RISE places a priority on working with students and graduates from local school systems. While internships and student initiatives such as RISE and Sustainable UH are one way of encouraging students to remain in Hawai’i, local businesses and organizations are also meeting this goal by actively hiring young adults and recent graduates. In fact, according to the Hawai’i State Department of Labor and Industrial Relations, between 2010 and 2012, the number of green jobs within the state is expected to increase by 26 percent, accounting for 2.9 percent of total employment. Each month, WiRE hosts a discussion panel brunch covering topics related to renewable energy, legislation and workforce development. At their first meeting in January, Ivory McClintock, a 22-year-old graduate from U.H. at Manoa, spoke about her experience finding employment in a green business and the importance of creating more jobs for young adults. “What I’ve learned is that you have to think outside the box, because the job you might get tomorrow might not yet exist today,” says Ivory, who found employment with the Blue Planet Foundation in the recently created position of program specialist. Ivory first learned about the Blue Planet Foundation through her involvement in Sustainable UH and was one of three students chosen by the organization to attend a nationwide clean energy event for students in Washington, D.C. For the next year, she continued working on sustainable campus events and started volunteering with Blue Planet Foundation tabling events and canvassing neighborhoods for a light bulb exchange program. By the time graduation rolled around in May, Ivory, who had once worked at a bikini store in Kaimuki, was hired by the organization for a full-time position. Sean Connelly, who graduated from U.H. at Manoa in 2009, found similar post-graduate success at the KYA Sustainability Studio, where he works with a number of recent graduates who were part of the HUB (Help Us Bridge) team that founded Sustainable UH five years ago. Revising the way students view career options is also one of the main focuses in Shanah’s honors program class, Sustainability and Internships. For their final assignment, Shanah challenges her students to write a paper on how they would help organizations and businesses go green. “It teaches them to put the lens of sustainability on any career,” says Shanah, whose students come from varying majors: business, economics, urban planning, engineering and political science. In addition to campus student groups and RISE, there are a number of local internships and programs available for young adults to get more involved in the environmental community. The University of Hawai’i’s Center for Smart Building and Community Design hires student interns to work on grant projects and research, and MA’O Farms in Wai’anae has a two-year student internship on organic agriculture. The most recent addition to the educational sphere is the Hawai’i Green Collar Institute (HGCI), which offers long-term weekend programs for high school and college students, exposing them to various green jobs and professionals around the state.